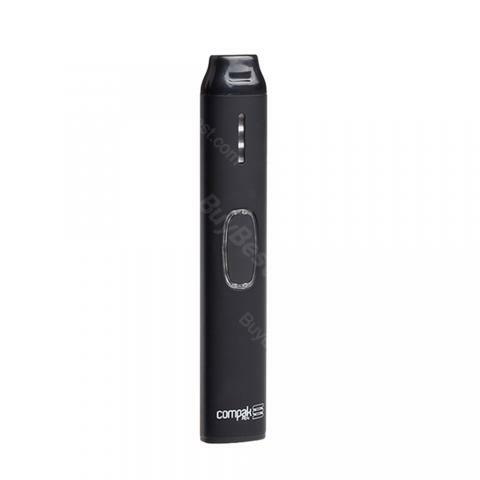 As an alternative nicotine vaping device, the Compak Pen Kit is an elegant and small vaping starter kit with built-in 350mAh battery and 1ml pod tank. With a 1.6ohm coil, the Pen AIO Kit is best used with 50% VG e-juice. Compak Pen Kit from Sigelei is a compact pen style starter kit which is easy to carry with comfortable hand feel. Compak Pen comes with 350mAh built-in battery and 1ml refillable pod. Powered by a unique 1.6ohm coil head, Compak Pen Kit is perfectly used with 50% VG e-juice to bring you a different vaping experience. Together with a clear light indicator, the Pen Kit is absolutely your best pal on the road of quit smoking. • Recommended to use with E-liquid at the Ratio of 5 to 5. Recommended AAA+++ ,Quick shipping and the order is spot on. Thanks! And graet Seller ,Arrived in good order. No problems. Would order from this company again. Great starter kit, whose sleek design and durable fire button are 2 things I love! Sehr schnelle Lieferung, Produkt gut verpackt. Compak Pen ist recht handlich - sie wirkt sehr gut verarbeitete.